President Obama’s strategy for the 2010 election was to increase the Democratic base turnout. He was successful as base voter groups increased their level of participation from the 2006 election, when Democrats won by 8 points and won both the House and the Senate. Liberal Democrats, women, African-Americans, urban voters increased their participation in 2010, while younger voters and Hispanics matched their 2006 level of turnout. But on election night, despite better base turnout than 2006, Democrats lost to Republicans by a 7 point margin. How could a slightly better turnout composition for Democrats end up generating such a dramatically different outcome? In contrast to President Obama’s base strategy, John Boehner’s strategy was to try to build a majority coalition based on the idea of “Winning the Issues.” His belief was that in a center-right country, the center-right party should win if they focused on issues, specifically jobs and the economy in the current environment. As a result, the closing arguments of these two strategies resulted in a decisive outcome favoring Republicans as they made significant progress with a number of important swing voter groups. But the key was their extraordinary success with the political center – Independents. In 1994, Republicans gained the majority winning Independents by a 14 point margin. In 2006, Democrats gained the majority winning Independents by 18 points. In the 2010 election, Republicans won Independents by 19 points. John Boehner’s question “Where are the jobs?” decisively beat President Obama’s “keys to the car” analogy. Obama’s “blame the Republicans” message reflected the Democrats’ negative strategy and served as its central theme. He argued, especially in the closing weeks, that Bush policies had put the “economic car” in a ditch, and that he had spent the last two years getting it out. Now wasn’t the time to give the keys back “to the folks who got us in the ditch in the first place.” This partisan message appealed to the Democratic base, but it had an unintended consequence. It alienated swing and Independent voters by trying to make Bush and his policies the issue rather than the effectiveness of Obama’s own policies. Democrats recognized that the election was going to be held on national terms – unlike the Republicans in 2006 – but the claim that Obama had gotten the “car out of the ditch” was poorly received by voters after 14 months of 9.5% or more unemployment. In contrast, John Boehner’s Republican narrative, derived from the “Winning the Issues” strategy, rested on one basic question—“Where are the jobs?”— reflecting the central question on voters’ minds. Republicans were generally successful in defining a new issue direction with the help of the Republican “Pledge to America,” which voters were broadly aware of even if they were not familiar with the specifics. Boehner’s emphasis on voters’ top issue—jobs—was also in direct contrast to President Obama’s agenda of the previous two years which focused on issues designed to satisfy his political base i.e. health care, cap and trade and even the stimulus package. For most voters, the issue of the economy in contrast with other issues is a little like a house with a fire on the roof. 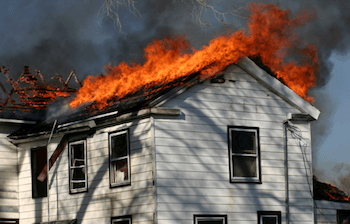 While windows may be broken, electrical work needs to be done and the foundation is cracked, fixing them, important as they are, doesn’t matter until the fire is put out. That was the context of jobs and the economy in this election; and from voters’ perspective, President Obama spent too much time on other issues like cap and trade and health care rather than the fire on the roof—jobs and the economy. In 2010, any political leader not discussing the economy and jobs was simply on the wrong topic and seemed out of touch with the concerns of the American voter. Among those who voted in 2010, according to New Models, the economy/jobs dwarfed every other issue, including health care and deficit/spending. In the media Exit Poll where there were just four issues to choose from, 63% of voters said the economy was the most important issue. This is not to say that other issues were not important, but rather the concern for jobs was overwhelming. In contrast to the Republican narrative of “Where are the jobs?,” President Obama and Democrats focused on their base by attacking Republicans, leaving Independents open to hearing economic arguments from Republicans. According to the Exit Poll, among all voters who said their top issue was the economy, Republicans won by an 11 point margin and among Independents who said the economy was their top issue, Republicans won by a slightly larger margin — 15 points. The frustration with President Obama’s major economic initiative, the stimulus plan, was seen in the Exit Poll as well. Only 32% of voters said that the plan was working, while 65% said it was hurting or making no difference. Critically, those who said the plan was making no difference voted for Republicans 57-39, an 18 point margin. 77% of midterm voters agreed that “Where are the jobs?” was the central question in the election, according to the New Models post-election study. This question addressed the concerns of all Americans, not just one political base or the other. Since the 2008 election, the top issue in the minds of the electorate had been the economy and jobs. This was the reason why “Where are the jobs?” resonated greatly with voters across the spectrum. Why was the Republican narrative so effective? For one simple reason: it was issue based. In the 2008 election, Democrats ran against the unpopular policies of George Bush and advocated “change” while Republicans ran against Obama by trying to define him as a “celebrity” using ads featuring Britney Spears and Paris Hilton rather than offering voters an argument for McCain’s economic policy. McCain didn’t lose because a less conservative electorate showed up at the polls. In fact, the 2008 electorate was farther to the right than the 2000 electorate that gave Republicans control of both the White House and the Congress. 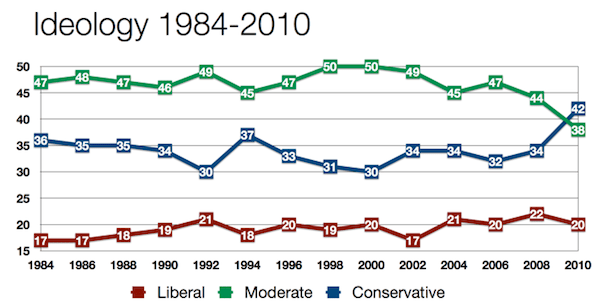 In 2000, moderates outnumbered conservatives by 20 points, 50-30. In 2008, that margin had been cut in half to 10, with moderates outnumbering conservatives 44-34. After the 2008 election, it was clear that the key failure of the McCain campaign was its focus on personality. That strategy frittered away the Republicans’ issue advantage of a center-right party with a center-right electorate. In response to the lessons learned in the 2008 campaign, Boehner and the Republican Congressional leadership developed a strategy based on “Winning the Issues,” which set the stage for the policy battles of 2009 and 2010. Although the President’s policy agenda was almost immediately out of sync with voters, he began his term with the political winds at his back, the kind of popularity almost all new presidents enjoy. In March of 2009, when the electorate was asked in a New Models survey which party they preferred to handle several key issues, Democrats held a huge lead in all of them, even on the issue of taxes. But Obama’s economic policies failed beginning with his promise to hold unemployment at 8% or below. Republicans believed that his Keynesian approach to creating jobs was highly unlikely to work and from the “Winning the Issues” strategy came the “Where are the jobs?” narrative which they developed in June 2009 and sustained for the next 17 months. The Republican “Pledge to America” was an important factor in supporting that narrative as it helped discredit the Democratic attack on the GOP as the “Party of No” with no new ideas. The “Pledge” was a central element of the “Winning the Issues” strategy, an effort to move Republicans from being an opposition party to being an alternative party and to show Republicans could govern. When voters were asked in the New Models survey which party they trusted to handle certain issues, on the issue of jobs Republicans trailed by 24 points in March 2009. On Election Day, they led by a 6 point margin. When it came to the economy, Republicans went from trailing by 20 to leading by 9. The issue of health care shows the extent of the issue handling shift toward Republicans. After having trailed by 29 points, which was not dramatically out of line with Republicans historical standing on this issue, Republicans led by 3 by the election. The last time Republicans led on the health care issue was shortly after the 1994 election. President Obama’s health care plan may have helped with his base, but hurt Democrats’ standing with Independents, both in terms of the substance of his policies and concerns the President was on the wrong topic. In the New Models survey, voters disapproved of his health care plan by a 44-52 margin. As a result of this disconnect and the poor performance of the economy, President Obama’s job approval on Election Day was underwater, with 44% approving and 55% disapproving. The majority coalition he built in 2008 collapsed. In the end, the “Where are the jobs?” narrative became the glue that allowed Republicans to tie together numerous voter groups, representing a variety of economic concerns that ranged from jobs to spending to the deficit. With the Democrats sticking to a base attack strategy, economic issues at the center of discussion and the electorate more conservative on economic issues, the elements of a new center-right majority coalition were in place for a Republican win. One of the most important outcomes of this election and one that has received little attention is the size of the Republican gains made with key swing voter groups. Republicans won the election by rebuilding a center-right majority coalition. Republicans won the election by rebuilding a center-right majority coalition. 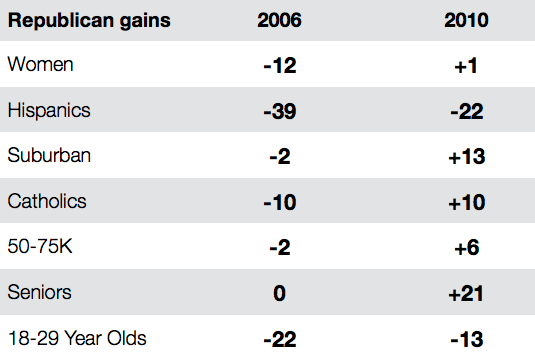 The Republican gains with key voter groups cut across age, gender, income, region, and race to build a majority. The following table contrasts the back-to-back off-year elections of 2006 and 2010 and their dramatically different results. The table shows the size of the Republican margin with each of these important groups. The 2010 results were significant improvements that also showed the extent to which President Obama’s majority coalition has fallen apart. Republicans won women outright, something they had not done during their previous congressional majorities. They improved with Hispanics going from 30 to 38% of their vote. Republicans won seniors by a huge margin, won suburbia, middle income, Catholics, and improved with younger voters. But the key group in the election was Independents. To understand the importance of Independents, one only needs to look back to the 1994 election, when Republicans won majorities in both Houses, and 2006, the year Republicans lost their majorities. One of the great “urban legends” of modern campaign politics is the belief that Republican turnout was the reason for the GOP win in 1994 and its loss in 2006. The Exit Poll in 1994 found that 36% of the electorate was Republican, and Republicans won their base by a 91-8 margin. So what happened in 2006? 36% of the electorate said they were Republican and Republicans won them 91-8. The difference between a GOP victory and a GOP loss wasn’t base turnout; it was Republicans’ ability or inability to win Independents. In 1994, Republicans won them by 14 points. In 2006, they lost them by 18. The key thing to understand about Independents is that they are the political center – not the ideological center, which is why Republicans are able to build center-right majorities especially when the debate is focused on economic issues. The 2010 exit poll also reflects that same center-right identification with 47% of Independents saying they were Moderate, 40% conservative, and 14% liberal – an almost 3:1 conservative to liberal margin. 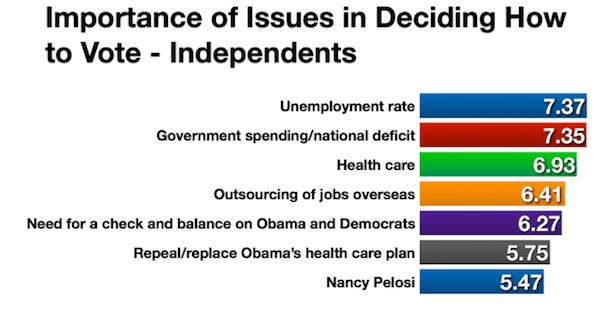 The issues that were of the most concern to Independents were economic ones, with the unemployment rate leading the way, followed by government spending/national deficit. Independents were much more attuned to issues than political messages. For example, Independents were far more focused on the unemployment rate and government spending/national debt than they were about the need for a check and balance on Obama and the Democrats. While Independents are a center-right group, they want solutions from candidates. Simply blaming the opposition doesn’t resonate with these voters. This was a problem for President Obama in 2010 as he placed the blame for the economic woes of the country on Republicans arguing against a return to the Bush policies. The stimulus plan didn’t fare well with Independents. The Exit Poll showed that 72% thought it had either hurt or made no difference, above the national average of 65%. Additionally, according to the New Models Survey, they disapproved of the health care bill by a 35-58 margin. As a result they had a very negative view of President Obama’s performance as President, with 38% approving and 61% disapproving. Obama’s closing “car in the ditch” argument, designed to fire up the Democrat base, and Boehner’s broad based “Where are the jobs?” narrative reflected two very different strategies. The results were remarkably clear. According to the New Models survey, Independents said the Republican message made them favor Republican candidates (55-35) while the Democrat message made Independents less favorable to Democrat candidates (35-57). In the end, independent voters massively changed direction in 2010 and voted for Republicans by a historic margin of 19 points. After the 2008 election, there were many who believed Obama’s victory had redefined the meaning of “center-right,” which was used as a rationale for moving the country toward the left through a liberal policy agenda. That was a strategic miscalculation. This disconnect was seen immediately in the stimulus package with its focus on increased government spending. Even at the time, this policy direction did not reflect the country’s policy choices. In a CBS survey done in February 2009, the country preferred reducing taxes on business to get the U.S. out of the current recession over increasing government spending by a 59-22 margin. As the details of the stimulus plan became public, voices of concern were heard and not just in partisan circles. Add to this the Administration’s promise to hold unemployment below 8% with quick passage of the stimulus and by May when unemployment hit 9.4%, President Obama had a major miscalculation on his hands. But instead of focusing on the economy, he went to his Democratic base on the issues of global warming/environment and health care, both of which were viewed by the public as expanding the role of government. In the Exit Poll, 56% of the country said government was doing too much that should be left to businesses and individuals, while 38% said government should be doing more. The Tea Party played a critical role in 2010 by helping focus the policy debate on economic issues. In the New Models survey, 15% of the electorate said they consider themselves part of the Tea Party movement. In the Exit Poll, voters said they supported the Tea Party by an 11 point margin, 41-30. 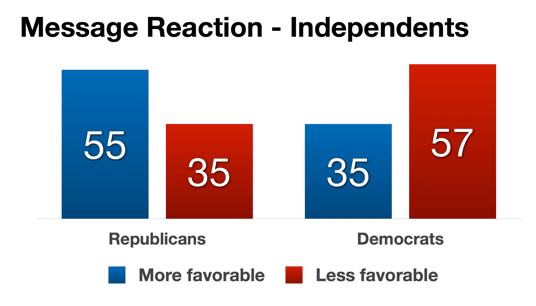 In the New Models survey, the favorable-unfavorable for the Tea Party was 45-44, but among Independents it was 53-39. While some Tea Party candidates struggled individually, the movement’s focus on fiscal conservatism significantly impacted the political discourse on the issues that eventually decided the election. The Tea Party joined the debate in response to Obama’s economic policies but as the campaign continued, the Tea Party movement helped delineate the ideological choice before voters in 2010. Did voters want a big government approach to fix the economy (liberal) or a smaller government approach with less spending, less taxes, and less regulation (conservative)? Because the electorate tends to be more conservative on economic issues, when the debate consistently focused on this ideological choice, voters spent more time engaged in the more conservative side of their ideology. Thus, we saw a significant shift in voter self-identification toward conservative in the 2010 exit poll. Exit polls have shown for decades that moderates have consistently been the largest voting bloc with conservatives second, significantly outnumbering liberals. Until 2010, the nearest conservatives had come to moderates in self-identification was 8 points in 1994 (37-45). In this election, conservatives emerged as the largest ideological voting bloc—a significant result, which produced the largest shift in Congressional seats in 60 years. During the time-period from 1984 through 2008, moderates had never made up less than 40%, and conservatives never more than 40%. Both groups shifted in this election as moderates fell to 38% and conservatives went up to 42%. Clearly, the voters’ shift to the right in self-identification was a key factor in this election. When voters were asked in New Models to characterize their present ideology on a scale of 1 to 9, with 1 being very liberal, 5 being moderate, and 9 being very conservative, voters placed themselves at a 5.9. When asked where they would put themselves five years ago voters put themselves slightly to the left of where they are today, supporting the notion of an ideological shift as seen from the Exit Poll. When asked where they would place Republicans in Congress, voters put them to the right of themselves at 6.44, and placed Democrats in Congress far to the left at 3.54. President Obama was viewed slightly farther to left than Democrats in Congress. Democrats and liberals viewed him as in the center, while Republicans, Independents, conservatives, and Moderates viewed him to the left. Voters, particularly Independents, place themselves closer to Republicans than Democrats. This difference is the strategic advantage a center-right party has in this country. When Republicans aren’t talking about issues, they lose that advantage. The center-right nature of the American electorate has historically been and remains the potential foundation for Republican majorities. When Republican efforts focus on winning issues, as in 1980 and 1994 and now 2010, the results are positive. What is particularly interesting is that the strategies of both President Obama and John Boehner achieved their objectives; the Democratic base turnout was higher than what it was in 2006 and Republicans were able to build a center-right coalition. 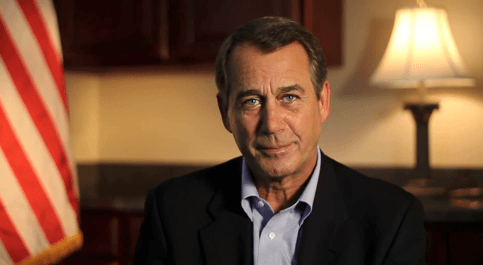 The obvious conclusion is that Boehner’s was a winning strategy, while Obama’s was a losing one. In fact, Obama’s strategy helped Boehner’s be successful, as it never competed for votes in the center, and the Democratic political discourse helped move the political center toward the Republicans. In the end, President Obama’s base strategy versus Boehner’s center-right majority coalition strategy reinforced two political lessons learned now over several elections. 1. Neither the Republican nor the Democratic base is large enough to produce a majority. 2. As a center-right party in a center-right country, Republicans have a strategic advantage if the party focuses on winning the issues. New Models Survey conducted by The Winston Group among 1,000 people election night who voted in the 2010 midterm elections. Media Exit Polls conducted by Edison Research among 17,504 voters on election day who voted in the 2010 midterm elections at the House level.